Concerns About Cholera Rise In Pakistan : Shots - Health News With clean drinking water scarce for millions of people in flood-ravaged parts of Pakistan, the risk of a cholera outbreak is increasing. 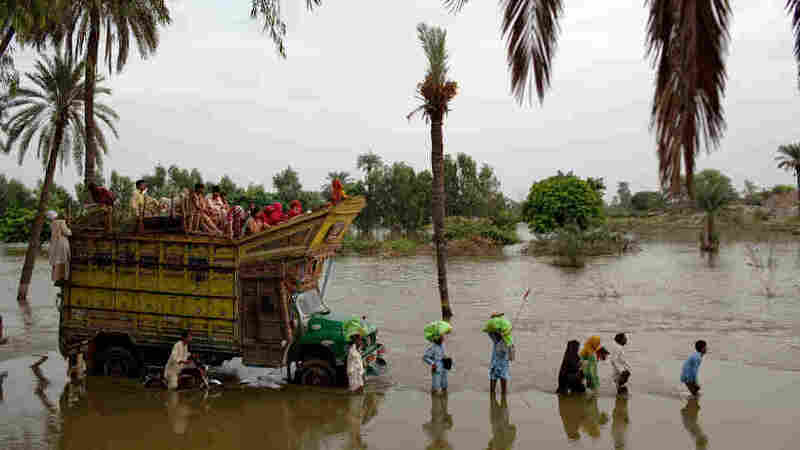 Health officials are growing increasingly concerned about a potential health crisis in Pakistan, where heavy flooding has left millions homeless. As rains continue in some parts of the country, fears of a cholera outbreak are intensifying. "Basically there is no question" there's a major risk of an outbreak, says Dr. Michael Merson, the founding director of the Duke Global Health Institute who has treated cholera cases in Bangladesh. The disease is transmitted through contaminated food and water. Cholera's hallmark is extreme, life-threatening diarrhea. Patients can have a stool output of one liter per hour, Merson says. "It's a very frightening illness because people get dehydrated very quickly," he says. "People can die in a day or two." But treatment to prevent death is pretty straightforward. Rehydration therapy to replace fluids and restore electrolytes can lower the death rate to less than 1 percent. The world has been slow to deal with the situation in Pakistan compared with the response to other natural disasters, however. "Twenty-two U.S. aid groups have raised a total of $10.6-million to assist the estimated 20 million people affected by the floods; two-and-a-half weeks after the Haiti earthquake, 40 aid groups had brought in a total of $560-million," The Chronicle of Philanthropy reported. Without adequate aid to ensure Pakistanis have access to clean drinking water, the odds of an outbreak increase. A severe cholera outbreak could be even more lethal than the flood itself, which has killed about 1,500 people. About 3.5 million people in the areas of Pakistan hit by floods are thought to be without access to clean water. See this slide show for photos of the scene. Last July, the Red Cross released a report showing that a cholera outbreak in Zimbabwe, which had gone on for about nine months at that point, killed more than 4,000 people. An outbreak in Nigeria has killed more than 350 people in the last three months. Merson hopes more can be done soon for Pakistan. "I understand donor fatigue and frustration," he says of the slow pace of aid to Pakistan. "But on the other hand this is an acute emergency. This is not a normal situation."